Extraordinary waterfront vacation home rental located in Pompano Beach. Solaco vacation home is a 3 bedroom 2 bathroom single family home available for weekly rent throughout the year. 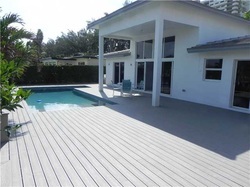 This new vacation home rental was completed in 2013 with 3 bedrooms and 2 baths in a split floor plan; decorated in the "MoMi" Miami modern style with a large dock space. This spacious property easily accommodates 6-8 people. Everything is new and the home has impact glass windows and doors. Located on the Fort Lauderdale and borders Pompano Beach offering easy beach access to Lauderdale by the Sea, Pompano Beach Golf Course, downtown Fort Lauderdale and famous Las Olas.